Alexis del Palazzo is a flutist turned DPT student, marathoner, and "Musician with a passion for physical therapy." Naturally, I thought she'd be a great fit for our this community of readers and bodynerds, and I'm happy to have her contributions here! Alexis: I began playing the flute in 6th grade band when I was 11 years old. Exhibiting innate musical talent, I sang all the time but the only real music education opportunity available to me in my rural school was band. My older brother had been in band, and I was so excited to join when I was old enough. K: Tell us a bit about you got interested in physical therapy. A: I never knew any physical therapists growing up, and my impression was that most of them were former athletes. A DMA student at OU who attended the school while I was an undergraduate had a previous background in physical therapy but that was the extent of my exposure to the field. As I worked towards a MM program, one of my mentors and teachers during that time reawakened my interest in the body and movement. I reacquainted myself with my copy of Lea Pearson’s What Every Flutist Needs to Know about the Body and I attended the 2011 Andover Educator conference in New Jersey. At the conference, I met an Andover Educator who was also a hand therapist. During this time, I was having problems with my right arm. I was battling severe performance anxiety with huge adrenaline rushes that would make it difficult for me to play. In response, I would grip the flute incredibly hard and post-performance, I would have pain in my right forearm for hours afterwards. In spite of being prepared, my audition for grad school didn’t go very well - I was not only trying to play through extreme performance anxiety, but I was also playing through pain in my arm. The inflammation and pain was becoming more persistent. I had a similar problem as an undergraduate but the doctor only prescribed me a hefty dose of ibuprofen and told me to rest. That advice was totally useless to me as a musician, and I was hesitant to see another medical professional. Meeting and talking with this person at the conference helped me decide to see a doctor again and ask for a referral to physical therapy. Because I was wary of being treated by a PT unfamiliar with the demands of being a musician, I first drove from Central Pennsylvania to the D.C. area for an evaluation with a physical therapist there (also a musician). She shared my evaluation results with my local PT, and we got to work. As I watched the clinic staff work with other patients during my treatment, my interest level increased and I began researching everything I could about physical therapy and what was involved with becoming a PT. I was hooked. It took a month from the AE conference to receiving my own PT treatment to make a decision that this was what I wanted to do. In addition to educating musicians about moving better, I also wanted to be able to treat them as a medical professional. K: Amazing! How has your understanding of the body changed in your studies? How has your own relationship with your body evolved? Alexis' book, The Practice Matrix. Definitely worth checking out! A: Life never happens the way you want it to. It took 2 years for me to arrive at a place where I was able to begin the huge list of pre-requisite courses needed to even apply to a program. In those 2 years, I became an Andover Educator trainee to train to teach the course What Every Musician Needs to Know about the Body™. I revamped my practice routine, and incorporated all the bodywork lessons and time management techniques I was learning during this time. Via Body Mapping and the Alexander Technique, I discovered what habits were hurting my playing and through intensive, patient work, I began making changes to my body map and I made huge strides in my playing. I even wrote a book to help other musicians incorporate the same kinds of changes into their practice routines. Prior to starting work with Body Mapping and the Alexander Technique, my mind and body weren’t very well connected. As an introvert, I spend a lot of time in my mind and my thoughts tended to control me. I believed that I had no control over how I moved. The musculoskeletal system was also a huge mystery to me as well, and I had many mismappings to address. I began practicing mindfulness, and I learned that I did have a choice. I could choose to simply notice my thoughts but let them go. I could choose to stop a movement and replace in its stead a healthier, more efficient movement. And learning this with my flute helped me become a better human being, a better musician, and a better teacher. In retrospect, I am so happy to have had that 2 year period to spend so much time on somatic bodywork. It helped me learn about my own body and help me develop my own self-awareness. These are all skills I can transfer into my own practice as a future physical therapist. K: What's one thing you wish musicians knew about health, wellness, and body! 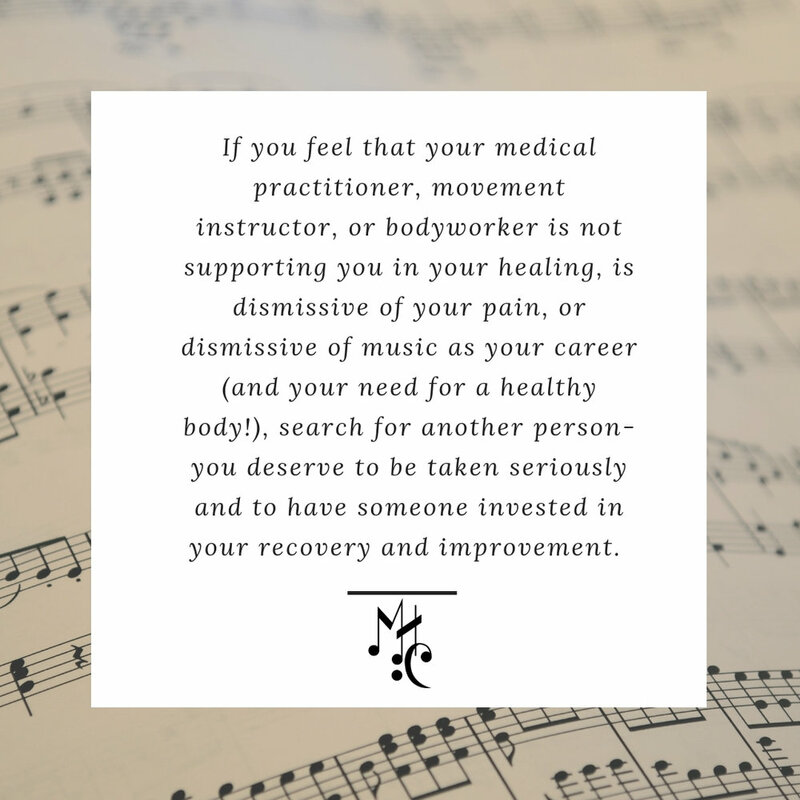 A: I wish that musicians would learn about health and wellness prior to being injured! I didn’t learn about the resources available to musicians until I was injured, and I regret not learning more sooner. Knowledge is power. Learning the structures of the body and how it works, and learning how to keep your body healthy will prolong your musical life. Make time to learn now, and you will avoid having to take time off later for pain or injury. Unfortunately, because these topics are only slowly becoming integrated into our music education system, most musicians don’t recognize the need for this kind of information. We have a long path ahead of us but it is encouraging to see increasing numbers of musicians become involved with somatics, medicine, and other modalities to improve the quality of musicians’ lives everywhere. A: This question is a work in progress. In addition to orthopedic physical therapy which is the most relevant type of PT for musicians, I am also nurturing a strong interest in neurologic PT and would like to possibly work with patients with traumatic brain injuries and spinal cord injuries. Ideally, I would like to be able to spend my days coaching and treating musicians, but also be engaged in patient care across all demographics. Physical therapy fits my wide range of interests from music, movement, fitness, education, and helping people and I want to cast my net wide. As I progress through school, this evolution will become more clear. I wish that I had discovered this path sooner, but I wouldn’t be the same caliber of musician I am, and I certainly wouldn’t have the understanding I do of musicians and the unique health challenges they face. K: How can people find you on the internet or contact you? A: I live in Central Pennsylvania with my husband, 3 dogs, and 5 cats. As of May 2015, I am a first year Doctor of Physical Therapy student at Neumann University. My current homes on the net are my Facebook page, twitter @sensibleflutist, and on my tumblr where I’m blogging about my DPT journey adelpalazzo.tumblr.com.